The Met revives Mozart's last opera seria. Giuseppe Filianoti (center) sings the title role in the Met's revival of La clemenza di Tito. Wolfgang Amadeus Mozart's La clemenza di Tito represents the composer's final effort in the genre of opera seria, the overwhelmingly popular style of the 18th century that drew thematic inspiration and its plots from the events and myths of classical antiquity. Composed in a rush of notes (Mozart had less than three months) for the coronation of Holy Roman Emperor Leopold II as the new king of Bohemia, the opera shares some parallels with Mozart's last opera, Die Zauberflöte. The story of Tito makes the Roman emperor Titus out to be a mensch. Its source: an old libretto by Metastasio, based on an incident mentioned in Suetonius's Lives of the Roman Emperors. Tito (Giuseppe Filianoti) responds to a failed assassination attempt by forgiving the assassin. This was librettist Domenico Guardasoni's attempt to encourage Leopold to show similar clemency. The opera was finished in three months, just in time for the coronation. its premiere took place one hour after Leopold took the throne. Alas, Leopold died six months later, so history never got a chance to find out what a nice guy he might have been. 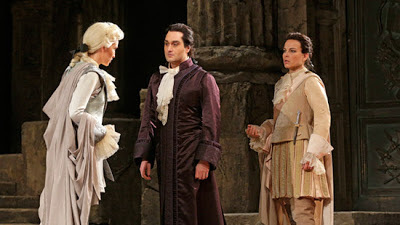 Although the part of the emperor requires a powerful tenor, the key role of this opera is Sesto, the would-be assassin. The part, written for a virtuoso castrato, requires a mezzo-soprano of power and flexibility, capable of showing a wide range of emotion. Elina Garanča rises to the challenge in a role she has sung to great acclaim in Vienna. Also in on the plot: Vitellia, sung by soprano Barbara Frittoli. This is yet another revival of Jean-Pierre Ponnelle's sturdy staging. Harry Bicket conducts. La clemenza di Tito opens Nov. 16. The Met will broadcast this production as part of its Live in HD series on Dec. 1. The Met's new Un Ballo in Maschera. 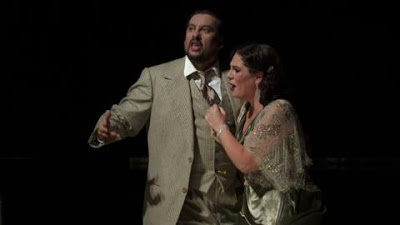 Nightmare and dreamscape: Marcelo Àlvarez and Sondra Radvanovsky duet in Un Ballo in Maschera. The Metropolitan Opera's new David Alden production of Verdi's Un Ballo in Maschera draws inspiration from the films of Ingmar Bergman. This surreal show plays out the libretto's love triangle as a series of vivid dreams. Which begs the question: if the masked ball is only a dream, does the assassination actually take place? The show-curtain and backdrop for most of the action is a huge, Raphaelite painting of Icarus falling from the sky. Acts I and II open with a main character (first Gustavo, then Amelia) asleep in an armchair--the action playing out as a dream of each character. 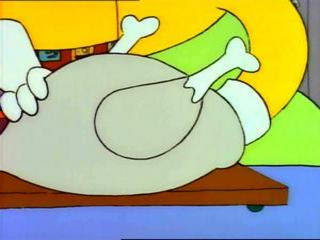 In the final act, the show evolves into a consensual hallucination. The masked ball seems equally inspired by J.K. Rowling and The Seventh Seal, as death avatars (in formal wear with black wings and skull masks) skulk through the dancing, anticipating the opera's grim climax. Given the singers playing the three legs of Verdi's love triangle (as heard on Monday night) it may not actually matter. Marcelo Àlvarez sang King Gustavo. The Argentinian tenor responded well to the spotlight, in a role that lay comfortably for his voice. In the early acts, he sounded relaxed and genial, with smoother tone than in years past. Signs of wear were apparent by the Act III Study Scene (one of the toughest parts of the score), but he sang the finale beautifully. The 2012 Richard Tucker Gala. 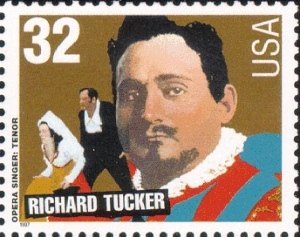 Made in Brooklyn: opera tenor Richard Tucker. The 2012 Richard Tucker Gala was held Sunday night. Image © 1997 The United States Postal Service. The 2012 Richard Tucker Gala was held this Sunday night at Avery Fisher Hall. The annual showcase for the philanthropic foundation named after the late, great opera tenor is always an important night in the opera season. 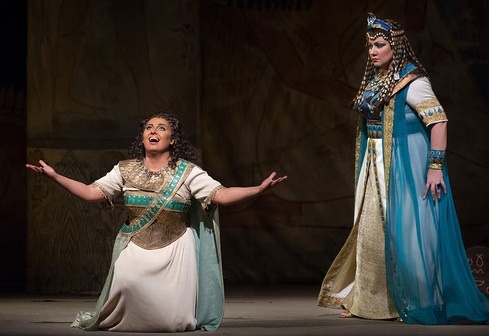 This year, singers, industry people and opera lovers heard this year's Tucker Prize winner, soprano Ailyn Pérez in a program that put a heavy emphasis on the music of Verdi. The Tucker Gala is a celebration of singing, honoring both the memory of the late Brooklyn-born tenor. The Tucker Foundation provides support and a showcase for young talent that is about to make a splash on the opera stages of the world. 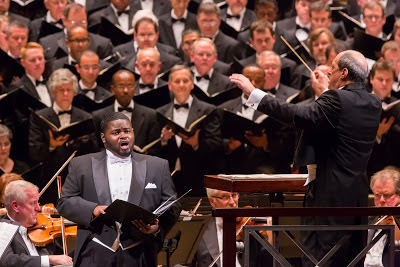 This year's concert also featured appearances from singers currently gracing the stage of the Met: baritones Gerald Finley and Dmitri Hvorostovsky, mezzo Olga Borodina and tenor Marcello Giordani. 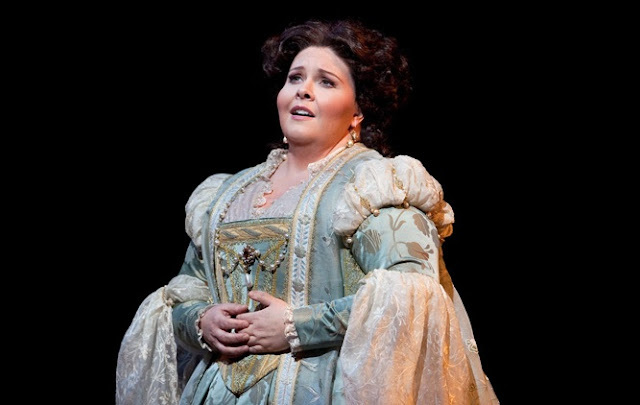 Ms. Pérez is the first Tucker winner who happens to be married to a past winner--tenor Stephen Costello. 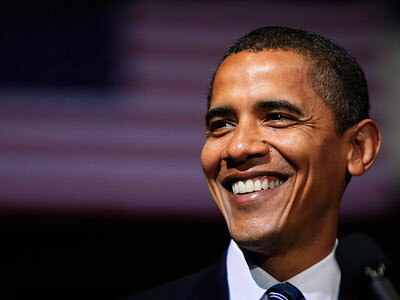 (He won in 2009.) She opened the concert with a fiesty performance of Manon's gavotte, easily adding the difficult ornamentation in the repeated section and producing a high, clear tone above the stave. On Saturday night, Avery Fisher Hall was packed to the rafters to hear the New York Philharmonic kick off the third concert in its season-long celebration of Brahms. 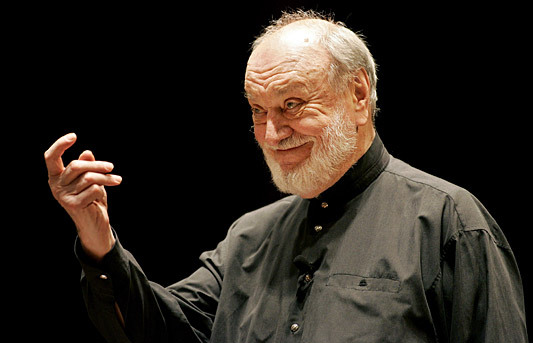 More importantly, this concert marked the New York return of former Music Director Kurt Masur, still tall and aristocratic but now visibly frail beneath his trademark Chinese silk conductor's jacket. After years of visible hand tremors (that somehow never interfered with his conducting) a fall last season in Paris and several cancellations, Mr. Masur finally admitted to having Parkinson's Disease this year. It has now accelerated. The conductor now prefers a specially designed podium, equipped with metal rails he can grip, to control the tremors while he conducts. In his walk to the podium, Mr. Masur stumbled forward. The audience drew a sharp, collective breath. 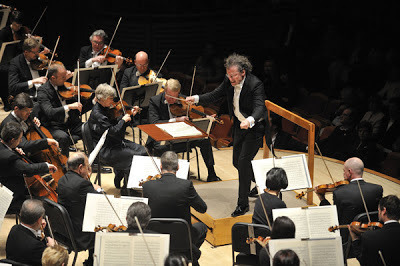 However, the conductor was all right--he recovered his balance and took his place in front of the orchestra. Adjusting himself for a line of sight with the soloists (violinist Glenn Dicterow and cellist Alicia Weilerstein) and concertmaster Sheryl Staples, he gave the first downbeat of the Double Concerto, Brahms' last orchestral work. 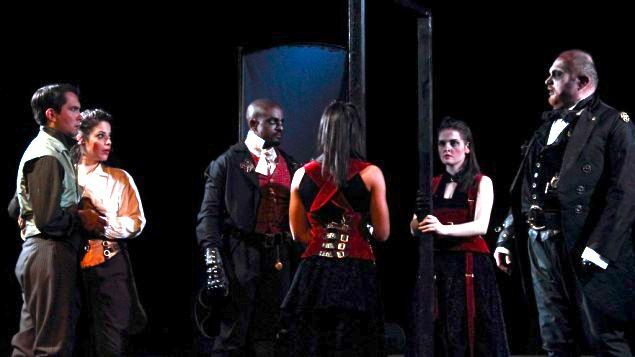 Chelsea Opera premieres The Mark of Cain. 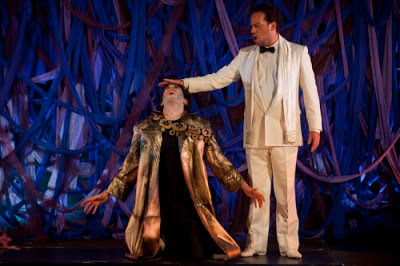 God (Tom McNichols) marks Cain (Brace Negron) in The Mark of Cain. 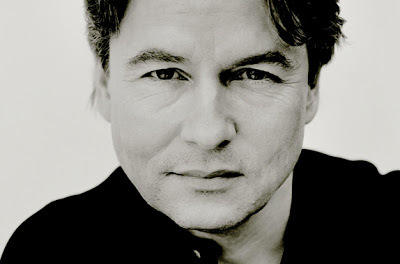 Photo by Robert J. Saferstein © 2012 Chelsea Opera. In a city that has forced itself to overcome long odds in the wake of recent events, the game Chelsea Opera company opened its season this week in St. Peters' Church on W. 20th St. Considering that their entire neighborhood was without power for most of last week, this opera company should be noted for its doggedness. Some singers even had to pedal all the way home from Brooklyn after performing rehearsals without heat. There are advantages and disadvantages to writing opera based on the Bible. In the plus column, there's a lot of unmined stories, because of the Catholic Church's longstanding prohibition on putting religious stories on the stage. The minus: a certain sameness of voice. Musical clichés that include: dissonant, crashing chords for acts of great evil, a slinky, minor-key "Asiatic" mode for woodwinds, chiming triangles and divided violins for the twin concepts of goodness and redemption. All of these musical clichés are present in Matthew Harris's The Mark of Cain, the one-hour one act opera presented this weekend by Chelsea Opera. Happily, an interesting libretto by Terry Quinn found new depths in the familiar story of Cain and Abel, and a strong cast of young singers did much to overcome the score's musical conventions. Trinity Wall Street presents free Bach concert. Event to raise money for Hurricane Sandy relief. The Choir of Trinity Wall Street. Photo by Leah Reddy © 2010 Trinity Church. 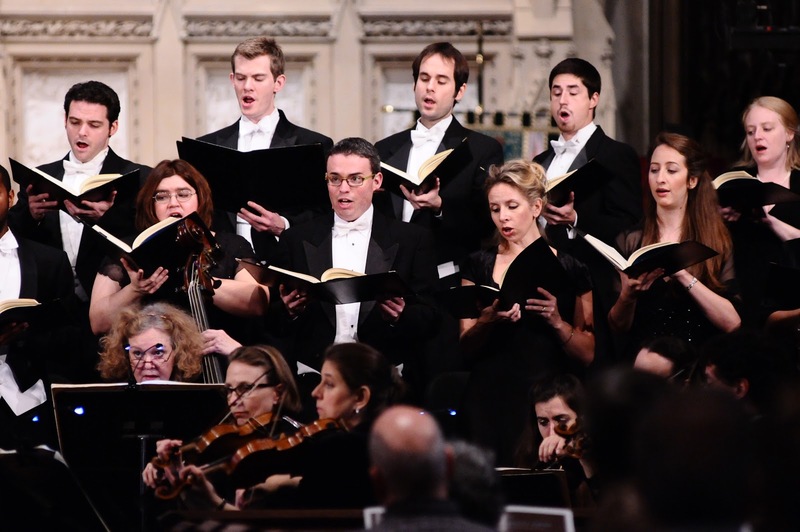 This just in: on Saturday night at 7:30pm, Trinity Church and the Trinity Choir will present a free performance of Johann Sebastian Bach's Mass in B Minor as part of an effort to raise funding to relieve the suffering of victims of Hurricane Sandy. Attendees at this concert are encouraged to donate to the Mayor's Fund to Advance New York City, a non-profit which will in turn disperse funding to relief organizations helping the 40,000 New Yorkers left homeless by the storm. Trinity's rector, Dr. James Cooper had the following comment: "Trinity Church has served New Yorkers in need for more than three centuries. There is no greater honor or privilege than to stand with our neighbors in this great city and to say, 'we are here to help.' I invite all to this concert to be uplifted by the music and by the spirit of your giving." 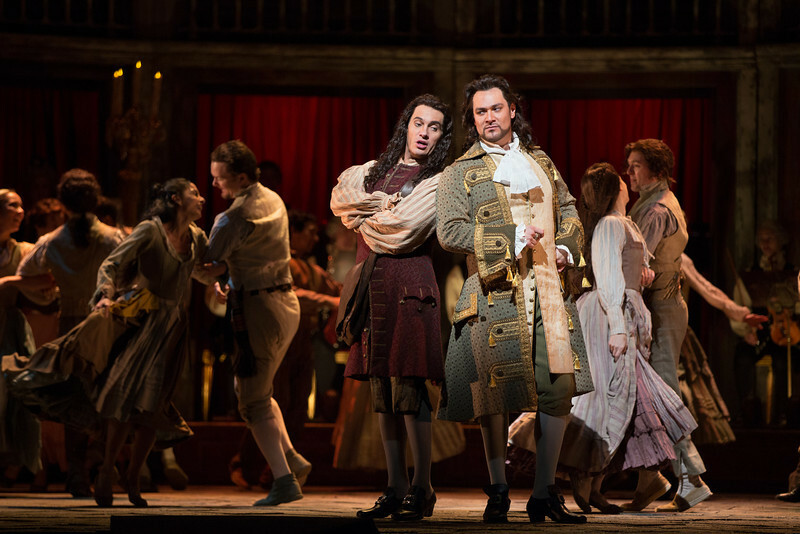 The guys dominate Le Nozze di Figaro at the Met. 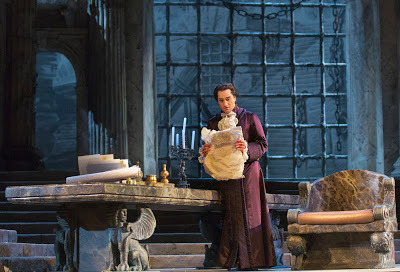 scheme with Figaro (Ildar Abdrazakov) in this year's Met revival of Le Nozze di Figaro. On Wednesday night at the Metropolitan Opera, Mozart's Le Nozze di Figaro was the perfect medicine for a city suffering from the aftermath of Hurricane Sandy and the nor'easter that howled outside, dropping five inches of snow on the city. Figaro is an ensemble piece, one which is usually dominated by the Countess (Maija Kovalevska) her pert maid Susanna (Mojdca Erdmann) and the cross-dressing page Cherubino (Christine Schaefer.) 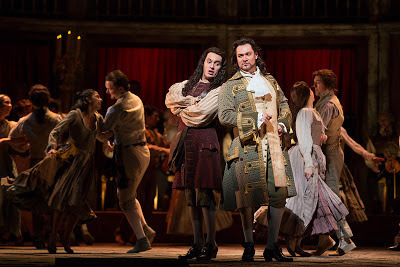 However on Wednesday night, it was the conflict between Figaro (Ildar Abdrazakov) and the Count (Gerald Finley) that held the audience's attention--a battle of wits and class between two men experienced in another Mozart role: Don Giovanni. The long string of arias and numbers in the first act seemed disjointed, despite Mr. Abdrazakov's rousing "Se vuol bailare" and "Non piu andrai." Matters improved in the second act, as the marital conflict between Ms. Kovalevska's Countess and Mr. Finley's Don raised the temperature of the performance through a series of tight, involving ensembles. Best of all was the Act II finale, as seven singers gathered in a coherent display of deliberate confusion. Murray Perahia in recital at Car...er...Avery Fisher Hall. 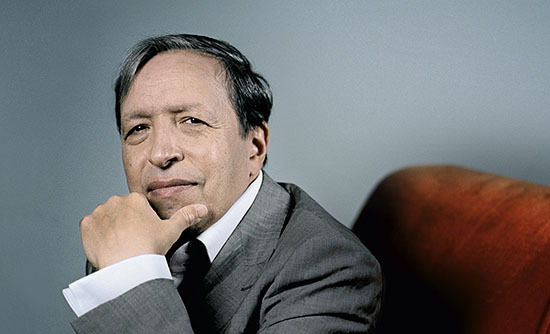 Hometown hero: the pianist Murray Perahia. Photo provided by Sony Classical. A recital in New York by Murray Perahia is always a major event. 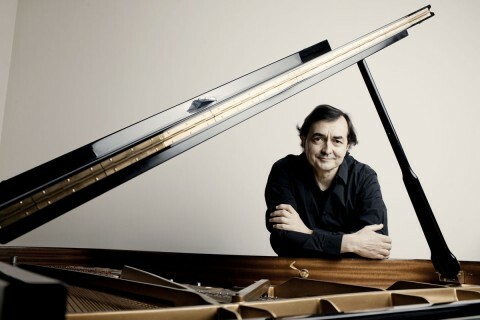 The pianist's preference for traditional repertory makes him a favorite among more conservative music lovers, and his Bronx birth makes him a hometown hero. In a city clobbered by Hurricane Sandy, that kind of heroism is what was needed as patrons gathered for a concert that was supposed to happen three nights before. You see, this Sunday night recital was originally scheduled for Friday night at Carnegie Hall. This change was necessitated by the aftermath of Hurricane Sandy, which left enormous, damaged construction crane dangling over W. 57th St. across the street from that historic venue, shutting down the venue, its attendant subway stops and all the local businesses for a two block radius. The program selected by Mr. Perahia for this recital may have had therapeutic qualities for his traumatized audience. It opened with the solemn, sylvan dances of Haydn's D Major Sonata, which went through a series of stormy passages before emerging in an optimistic conclusion. Mr. Perahia displayed a lightness of touch, making a coherent argument that this composer's superb, underrated piano music needs to be heard more frequently. on his re-election as the 44th President of the United States of America. Emanuel Ax and Mahler at the White Light Festival. 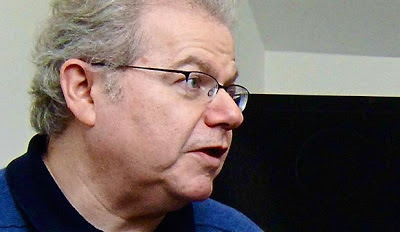 Emanuel Ax played at this year's White Light Festival. 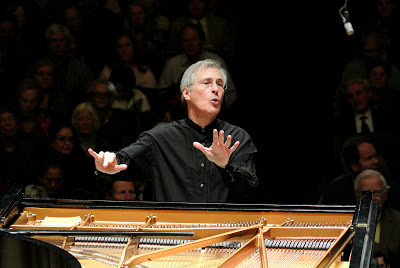 On Sunday afternoon, as their city staggered along its path to recovery from Hurricane Sandy, New Yorkers gathered at Lincoln Center's Rose Theater to hear an unusual hybrid of solo recital and concert featuring New York Philharmonic Artist-in-Residence Emanuel Ax and members of that same orchestra in a program billed as Song of the Earth. The concert (part of this year's White Light Festival) featured that penultimate work by Gustav Mahler was present , in its currently en vogue chamber arrangement by Schoenberg. This concert was really about establishing connections by placing music in proximity: the Mahler piece was preceded by piano works by Schoenberg and before that, Johann Sebastian Bach. The Bach work was the E♭ minor Prelude and Fugue (No. 8) from Book I of the Well-Tempered Clavier. Mr. Ax has only started playing Bach in public this year, and still uses the sheet music. Nevertheless, the slow, ascending steps of the Prelude led to a climax, followed by the descending, spiraling figures of this complex, fascinating fugue. 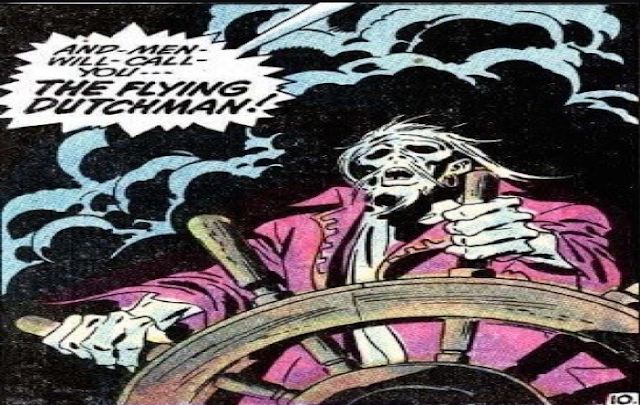 As always with this artist, there was a beauty of tone and clarity of expression which held the attention rapt in the darkened theater. The American composer was 103. 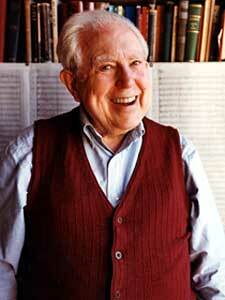 Elliott Carter died peacefully today. 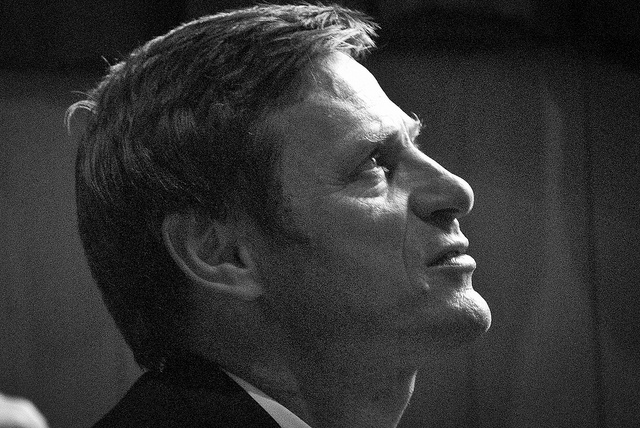 His death comes a little more than a month before his birthday, December 11. 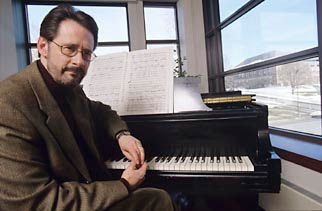 A report on NPR.org stated that according to his assistant, the composer died at home, of natural causes. Mr. Carter was at the cutting edge of composition and new music creation in a career that spanned from the 20th century into the new millenium. An iconoclast even in his later years,, he wa considered the dean of American composers, working out of his W. 12th St. apartment in the heart of Manhattan's Greenwich Village. Charles Dutoit conducts the New York Philharmonic. 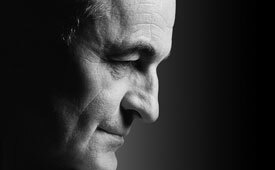 Conductor Charles Dutoit. Photo provided by the New York Philharmonic. 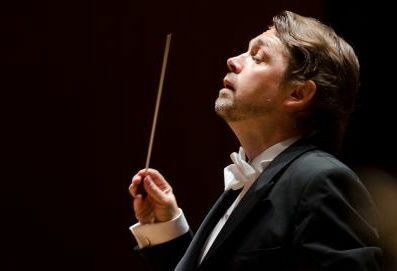 Soloist Nikolai Lugansky To Make Philharmonic Debut, Charles Dutoit To Conduct. On Saturday night, with one subway line providing access into Manhattan, this writer was able to see the New York Philharmonic perform this altered program under the sure baton of veteran Swiss conductor Charles Dutoit. The whole program sparkled. It seemed that New York's hometown orchestra wanted to please and soothe with these great works, and provide some measure of healing to an audience still suffering shell shock from the storm. The performance opened with a brisk, jaunty account of the Overture to Ruslan and Ludmilla, Mikhail Glinka's escapist fantasy based on a surreal drama by Pushkin. Mr. Dutoit and the orchestra produced the overture's Rossini-like rhythms with bold vigor, alternating with rich, Oriental colors from the double reeds. Some music for the storm recovery. 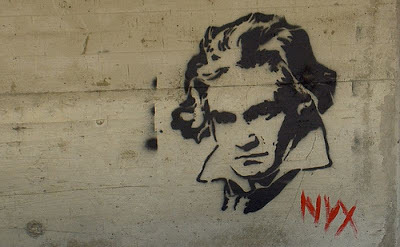 Last night at the New York Philharmonic concert, I got a little card in my Playbill, helpfully reminding me that November in New York City is Beethoven Awareness Month. As far as I am um...aware, this is the second year in a row that our city has celebrated the music of the great man. In light of recent events, I wanted to share the following clip, from Beethoven's only opera Fidelio, which ranks as my favorite piece that the composer ever wrote. It is a quartet in canon form, from the first act of the opera, and can hopefully serve as some kind of psychological balm in these chaotic days that have followed the arrival of Hurricane Sandy. The American Red Cross fund for Hurricane Relief. They need money. And if you can, visit a Red Cross blood drive and donate some of what flows in your veins. Occupy Sandy Our friends at the movement for social change have set up kitchens and distribution of relief centers in Brooklyn. They have a list of donation requirements. AmeriCares has set up its own disaster relief fund. The Salvation Army is also doing disaster relief. I don't agree with this organization's policies on sexual discrimination but will post this if you want to help their relief efforts. The Knights of Columbus, another organization I don't agree with but they are also out there organizing and donating. New York's food trucks are working to provide food for people displaced. Food Bank New York is trying to feed the people who are out of their homes. 1. Online – visit www.nyc.gov/fund. 253 Broadway, 8th Floor, New York, NY 10007. 3. Call – donations can be made over the phone at 212-788-7794. 100 percent of donations are being dispersed to relief efforts and organizations to meet the short- and long-term needs of New York City and its residents. This includes immediate aid such as the supply and transport of water, food, toiletries, baby supplies, blankets and cleaning materials to distribution sites, as well as longer term restoration and recovery efforts. To volunteer or for in-kind donations, visit www.nycservice.org. Performances are scheduled though Carnegie Hall is still dark. This dangling crane on W. 57th Street has closed Carnegie Hall. A sunny, if cold weekend is upon us, and as New York continues to struggle back from the devastating hammer-blow of Hurricane Sandy, here's an update on what's going on. In some good news for Brooklynites, subway service has resumed along the 4, 5, 6 between Brooklyn and Manhattan. The MTA and Con Ed are still working on draining the subway tunnels for the R and A trains, hard hit by the flooding. 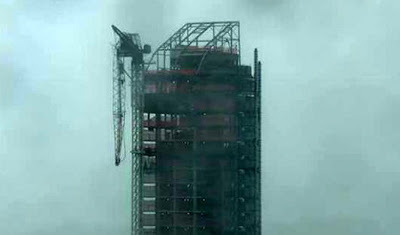 Carnegie Hall is unable to open its doors due to the damaged construction crane dangling over W. 57th St. The entire block (and the 57th St. N, Q, R train station) remains closed. The Friday evening recital with Murray Perahia has been moved to Avery Fisher Hall. The crane is scheduled for removal this weekend. The New York Philharmonic is open, with concerts tonight at Avery Fisher and a 5pm Sunday chamber performance of the Arnold Schoenberg arrangement of Mahler's Das Lied von der Erde. The concert, at the Lincoln Center Rose Theater (located in the Time Warner Center) features piano soloist and Philharmonic Artist-in-Residence Emanuel Ax. The Metropolitan Opera is proceeding with business "as usual." 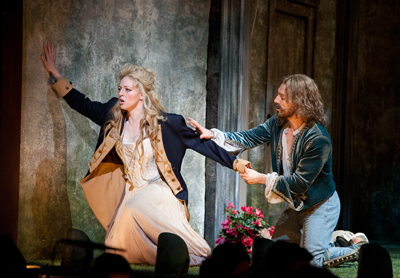 Today there's a matinee performance of Thomas Àdes' The Tempest and an evening show of Le Nozze di Figaro. Next week, look for more news about the company's new production of Un Ballo in Maschera which opens next Thursday. Here's some classical comfort food to get you through this difficult time. I know it helps me. The Atlanta Symphony Orchestra at Carnegie Hall. On Saturday night at Carnegie Hall, New Yorkers attending this year's appearance by Robert Spano and the Atlanta Symphony Orchestra and Chorus knew that a storm was coming. They didn't know that Hurricane Sandy would create the greatest natural disaster that this city has seen in a century, or that the venue itself would remain closed, due to the danger of a collapsed crane that has hovered over 57th Street this week like the anvil in the Metropolitan Opera's current production of The Barber of Seville. Concert programs for touring orchestras are determined well in advance of a performance. There was no way of predicting that the three works on this program (Aaron Copland's Appalachian Spring, Leonard Bernstein's Chichester Psalms and William Walton's 20th century cantata Belshazzar's Feast) would share the common thread of depicting the interference of the Almighty on people's everyday lives, even as Hurricane Sandy barrelled towards New York. The concert opened with the Suite from Appalachian Spring, one of Copland's most enduring compositions. Mr. Spano displayed the rich, dulcet tones of the Atlanta cellos and basses to full advantage here, creating a rich, woven texture shot through with the homespun authenticity of Copland's folk melodies. The sonorous climax (featuring the full statement of the Shaker hymn Simple Gifts created Copland's frontier idyll for the listener in rich, glowing detail.